Western National received a total of 10 Marshall bodied Bristol LH6L coaches- BDV 316L, BDV 318L, NTT 317-323M. The bodies were built to 7ft 6in width, for use on tour work around Dartmoor and Exmoor. 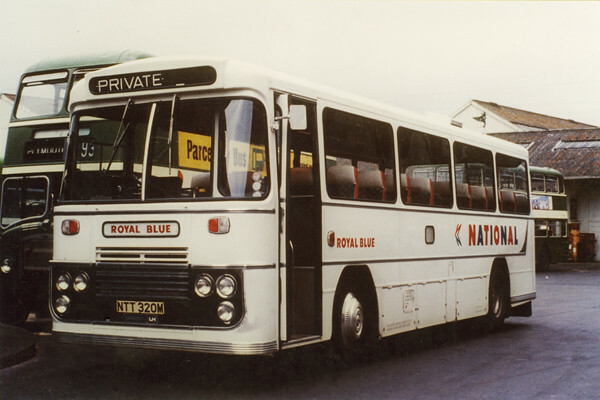 These were the last vehicles to be delivered in the Royal Blue livery, but within a year were painted into the NATIONAL white coach livery. I caught up with NTT 320M in March 1975, which was new in November 1973 and carried Royal Blue fleet names, by this stage it was painted in the NATIONAL coach livery, which means it was still classed as a front line coach. These coaches were used mainly on tour work and occasionally on National Express services. The letters LH denote Lightweight Horizontal, the first production LH was registered in March 1968, three chassis types were offered: LHS for 24ft overall length bodywork, LH for 32ft overall length bodywork and LHL for 36ft overall length bodywork. Two engine types were offered: Perkins of Leyland, both horizontal 6 cylinder diesel engines. The standard transmission was a Turner manual gearbox, but later the four and five speed semi automation transmission was an option. Most LHs were bodied as a bus, the lack of pulling power made them not popular as a coach, both by drivers and operators. The LH was popular with the National Bus Company who took it as their 'Country Cousin' type of midibus, a role taken over by the National B series. As a bus, the LH was a durable and functional vehicle. London Transport even took a number of ECW bodied Bristol LH buses, the BL class. At one stage British Leyland thought about re-naming the LH, the Leyland Cheetah, but the plan was dropped. The LH stayed in production until Bristol closed.